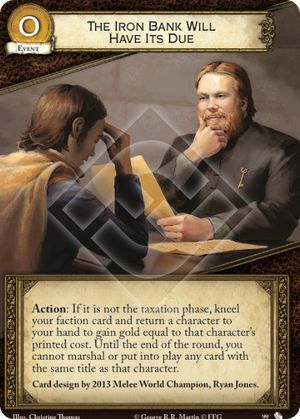 Action: If it is not the taxation phase, kneel your faction card and return a character to your hand to gain gold equal to that character's printed cost. Until the end of the round, you cannot marshal or put into play any card with the same title as that character. Card design by 2013 Melee World Champion, Ryan Jones. Characters returned to hand with The Iron Bank Will Have Its Due can be marshalled into shadows the same turn, but not brought out of shadows that turn.